1. Continuously drive forward until you are bumper to bumper with the car in front of you, or directed otherwise from a school employee or other designated traffic attendant. 2. 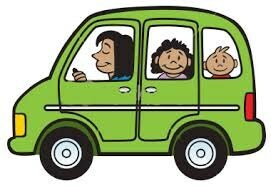 Have your child exit the vehicle on the passenger side quickly and safely. 3. Have your child ready to exit the vehicle after you have stopped in the drop-off zone (jackets and backpacks on). 4. Drive forward to exit. Make a right turn to exit the parking lot onto "Turnstone", make a left turn onto "Taft"; it will take you to a 4-way stop sign at "Blue Oaks Boulevard". Park or wait in your car in the bus loop area or kindergarten drop off zone. Cut in line to take an open spot to drop off your child. Get out of the vehicle to help your child. Store your child’s backpack inside the trunk. Leave your car unattended in the drop-off zone. Have a conversation in the drop-off zone. Drop off your child in the passing lane or any red zone. Park in non-designated areas of the parking lot. Park in the fire lane segment of the drop-off zone.